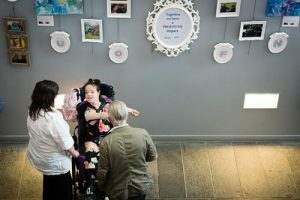 The University of Dundee is welcoming a second installation of “Together, we have a profound impact,” an exhibition of photographs and paintings developed by PAMIS for the Promoting Inclusion, Transforming Lives conference which took place in June 2017. The exhibit received high praise earlier this year from delegates at the conference and members of the public and is currently on display at the University of Dundee in the Dalhousie building foyer. Featuring a collection of striking images by photographer Gary Bottoms as well as stunning artwork by artists Erin Keogh and Sandra Duncan, the exhibition is currently on display until Monday 6th November.